Demon's Crystals is a low budget twin stick shooter that isn't too much of a burden on your wallet, though for that low price don't be expecting too much content or impressive graphics. The game can be played in single player (which I did) yet as I progressed I came to feel that certain elements really were reliant on a bigger team (this is up to 4 players). A group of Astral demons named Oricans were at the top of the food chain on Earth, that is until three mysterious entities arrived and turned the population of the planet into flesh hungry zombies and other such foul beings. Now the Oricans must collect crystals (their source of energy) in order to defeat each of the three entities in turn, so that the natural balance is restored. The single screen of text that makes up the story was pretty funny to me as it basically says that except from the three bosses, everyone you fight and kill in the game used to be humans. You kill a heck of a lot of enemies in Demon's Crystals before getting to restore order so does that make you a mass murderer even if the intention was just? Anyway that out the way onto the three modes that make up the game. Multiplayer is the one mode I didn't play due to playing it on my lonesome. From what I gather it has a competitive element to it, but that's all I can say. 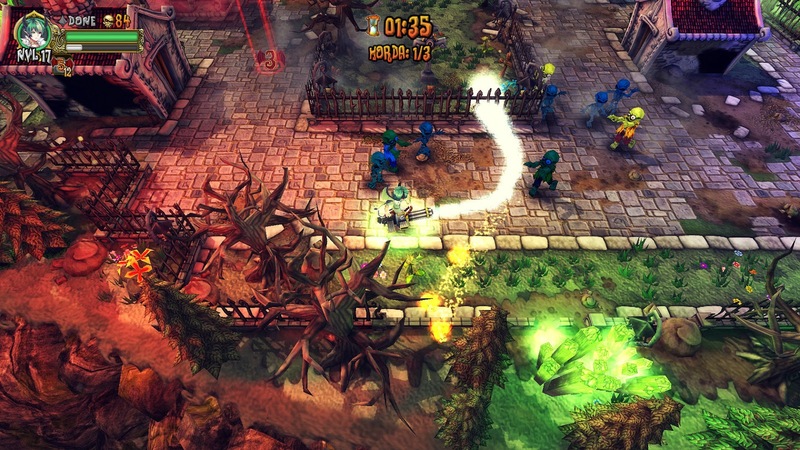 Then there is a score attack type option where you have to survive as long as possible against the never ending horde. Finally there is story mode. This is set over three different areas, each of which is made up of nine levels, the final one being a boss fight in each area. Each of the three places has its own unique enemy types. The graveyard unsurprisingly has lots and lots of zombies, second area; the castle features jesters who throw lethal playing cards, meanwhile the final area; the forest sees you battling both giant spiders and legions of orcs. These three places all have their own soundtrack to them and I must say all the the tunes are pretty catchy, I certainly didn't tire of hearing them. The graphics meanwhile are charming and crisp, though they are nothing too higher than what you would get on an Android or iPhone. So this is a twin stick shooter in which you play as one of four demons. These demons are identical to control, you pick up weapon cards that spawn in the levels, these give you greater abilities for a short while, such as being able to fire rockets, or drastically altering the spread of your attack. Enemies in turn also shoot back at you, though the majority are content to try and swarm you. The levels themselves have a lot of personality to them, while they are never too huge there is variation in how they look, some large circular arenas, others feature bridges and islands dotted around. There are also environmental dangers to watch out for such as zombie hands reaching out the ground to grab you, spike traps, and swamps that slow your movement. 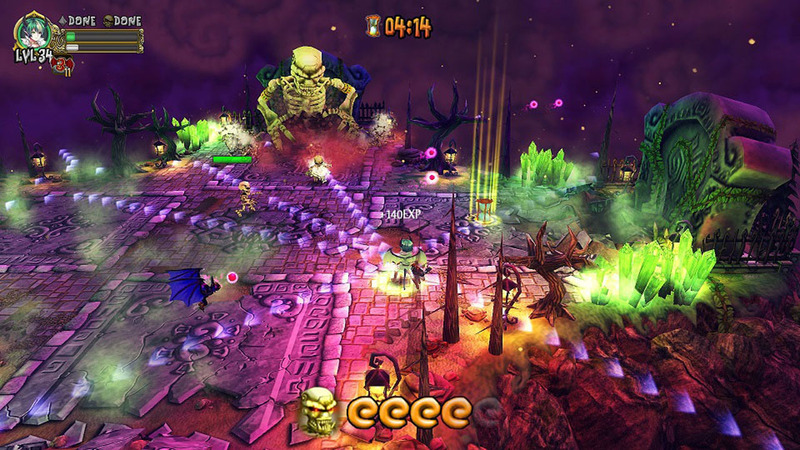 Each level is made up of one to three rounds that tasks you with either killing a specific number of enemies, or collecting a set amount of crystals. The game is fair at not making you replay too much should you die, you also constantly earn experience points that make you stronger and tougher. This one element helps reduce the frustration of getting stuck on a level as even if you mess up you have still gotten xp. The level cap though is bizarrely Level 90 and so the one time this failed was on the very tough (and cheap) last boss that took me around 50 attempts to kill as it was seemingly designed to be fought as part of a group. 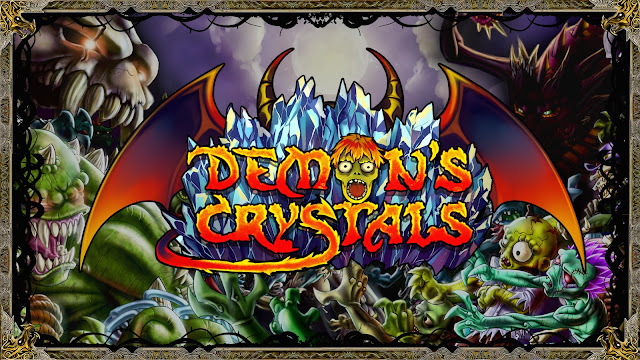 At best Demon's Crystals is inoffensive and fun while it lasts, but at it's worst it can be quite frustrating, especially that damn last boss. Still this is glitch and bug free and runs like a charm. For the cheap asking price you can't really complain so if you have friends who also own this then give it a shot and add on another zombie head to my score.